The looming war-crimes trial of Navy SEAL Edward R. Gallagher could be delayed nine months, according to a letter by Rep. Duncan Hunter of Alpine and Rep. Matt Gaetz of Florida. The congressmen decry what they consider “disturbing” conditions at the Miramar brig for Gallagher, accused of fatally stabbing a wounded teenage ISIS combatant in the neck. “Chief Gallagher’s current confinement is directly interfering with his right to a fair and speedy trial,” the pair write in a 520-word letter. 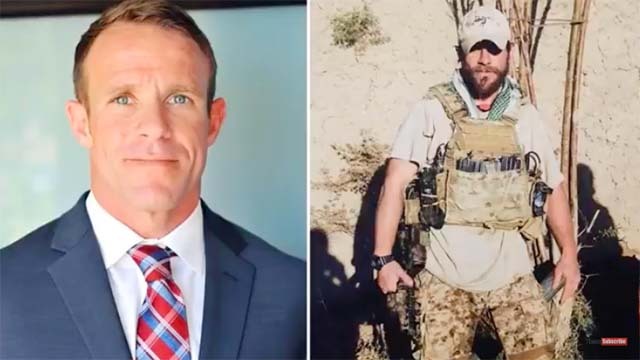 They allege that the Navy initially assigned lawyers to the San Diego-based special operations chief who were stationed 330 miles away, so Gallagher — who denies the accusations — was without any legal counsel for eight weeks. “Without ample access to his attorneys, how can Chief Gallagher even receive a fair or speedy trial?” the letter says. 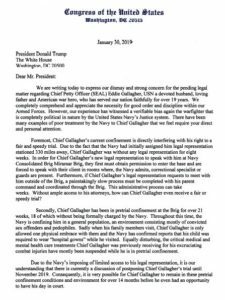 Gallagher’s court-martial is scheduled Feb. 19 to March 1 at Naval Base San Diego, said a Navy spokesman, who declined comment on the letter. News reports say a Friday hearing revealed that Navy SEALs have been granted immunity to testify. “Prosecutors expect to call the seven SEALs and up to 13 additional witnesses of the May 2017 incident in Mosul, Iraq,” said The San Diego Union-Tribune. Gallagher was arrested Sept. 11. Prosecutors presented evidence at a November hearing, including cell phone photos that show Gallagher holding up the head of the deceased fighter during a reenlistment ceremony. Prosecutors also alleged that Gallagher tried to bribe fellow SEALs to prevent them from talking about the incident to Naval Criminal Investigative Service investigators.